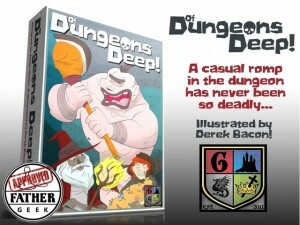 Grey Gnome Games is running a Kickstarter campaign for Of Dungeons Deep, their new card game of fantasy fun. The creators of numerous successful Kickstarters, including Four Tribes and Dig Down Dwarf, bring you a new blind bidding and deck-building dungeon delving card game. Of Dungeons Deep! is a fusion of many mechanics and was inspired by such games as Smash Up!, Dungeon Raiders, Cutthroat Caverns, and Friday and is set in an amazingly illustrated world that is whimsical, with just a touch of darkness. Of Dungeons Deep! takes a brave new look at a classic theme, is easy to learn, and employs simultaneous play which equates to almost zero downtime for players!